A few years ago, before I had kids, I decided to do some family history research. I’d always been interested in who my ancestors were, where they came from, and what sort of lives they lived. Thanks to Ancestry I found out a lot of information but one person always eluded me – my great grandfather. You see, my grandmother, Violet, was illegitimate. My great grandmother, Marion, had met and fallen in love with a soldier during world war one. She fell pregnant but unfortunately he never came back. Marion never put his name on the birth certificate and never spoke about him. She never even looked at another man. Worse though, her family disowned her for bringing shame on them all and it was a burden she carried her entire life. It’s a common enough story and only really means something to my family. My mother, who was very close to Marion, always wondered who her grandfather was and if she’d ever get to know anything about him. At the time it didn’t look good. On 19th of May, 2007 – my wedding day – I wore a beautiful old gold locket. It was my something old, given to my mother by Marion before she died, and it contained a picture of my grandmother as a baby and a tiny photograph of a handsome man in uniform. 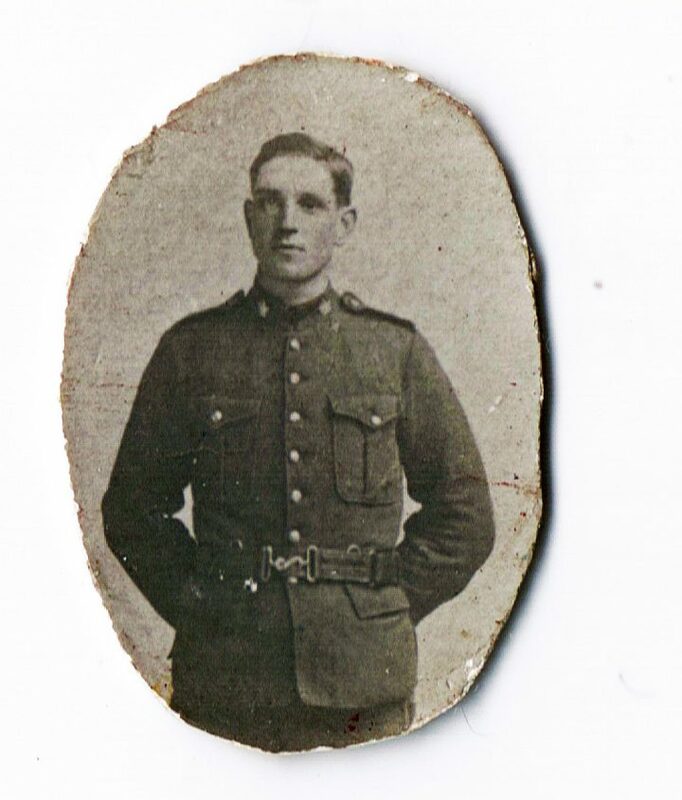 From the uniform we could tell that my great, great grandfather was a soldier in the Canadian Expeditionary Force. The trouble was that where we live in Kent, nearly all the Canadian Expeditionary Force passed through here. It was a training ground for all the new recruits so nearly every member of the CEF came through at some point before being shipped out to the front. The only thing we knew about this mystery man was that his name was probably Davis, as my grandmother’s name was Violet Davis Coburn. It was too obscure for a middle name so had to be something to do with him. The trouble is, there were 1147 Davis’ in the CEF and I’d need to go through every single record trying to match up dates for my grandmother’s conception. I said I would, but then life got in the way, as it always does! During my family history research I had an account with Ancestry and posted all the details there. It’s been years since I’ve used it, but then this week, something amazing happened. Out of the blue I had an email from Ancestry informing me that someone would like me to contact them about my great grandfather. I didn’t get my hopes up. Family history research is hard and it’s easy to link to the wrong record or get dates wrong. I didn’t mention anything to anyone until I knew for sure. I responded to the email the same day. My wish to know was too strong to leave it. And thankfully, the other person answered me quickly. Thanks to records recently released from the Canadian Archives he was able to make the connection between my family and his. William Arthur Davis died on 9 April 1917 at the battle of Vimy Ridge, less than two months after his illegitimate daughter was born. His army pension was paid to the mother of that child, Marion, my great grandmother. When I called my mother to tell her, she cried. Finally the man in the photograph had a name and more than that, we knew as much as it is possible to know about someone from the records they leave behind. We found out that he was an orphan, had two sisters, and is buried at Thelas Military Ceremony in Pas-de-Calais, just the other side of the channel. Our next trip to France will be to see his grave and to pay our respects to the only man my great grandmother loved and to all those soldiers who paid the ultimate price fighting for our freedom. For me, as a writer, I’ve always wondered what his story was and hoped it was one of love and loss rather than deceit. There was always a worry that maybe he was married or that for some other reason he chose not to come back. Thanks to Ancestry and its users, I know now that, though a sad story, it is one to be proud of. Has anyone else undertaken some family history research? What did you find that you weren’t expecting? I’d love to hear your stories, so please let me know in the comments below! It’s A Crazy, Crazy Life!